All prizes must be collected no later than Tuesday, 30 April 2019. In the event, for whatever reason, that the prizes are not collected or claimed before the stated date, the winner(s) will then forfeit any and all claims to the prize. What is the RM1 Million Prizes Giveaway all about? The RM1 Million Prizes Giveaway is a celebration by redONE to appreciate all of its new and existing customers by giving them a chance to participate & win amazing prizes in a Prizes Draw campaign. When does the RM1 Million Prizes Giveaway start? From 1 October 2018 to 31 December 2018.
Who is eligible to participate in the RM1 Million Prizes Giveaway? All redONE employees, partners and their respective immediate family are NOT eligible. What prizes do you offer in the RM1 Million Prizes Giveaway? How do I participate in the RM1 Million Prizes Giveaway? All you have to do is register or port-in a line to become a subscriber of a redONE Postpaid plan and ensure your line is activated before 31 December 2018. After that, you are automatically eligible to participate! I have two (2) redONE Postpaid sub-lines under my master account, are they eligible to participate in the RM1 Million Prizes Giveaway? Yes, as long as the lines are subscribed to a redONE Postpaid plan, they are automatically eligible to participate in the RM1 Million Prizes Giveaway. I have MNP Port-in a line to redONE before 31 December 2018 but I only managed to activate my line on 2 January 2019. Am I still eligible to participate in the RM1 Million Prizes Giveaway? Unfortunately, you are not. All lines must be registered and activated before 23:59 hours (GMT+8) 31 Dec 2018 to be eligible for the RM1 Million Prizes Giveaway. When will you select the RM1 Million Prizes Giveaway winners? All winners will be selected on the 2nd Week of January 2019. When will the winners be notified and announced? All winners will be notified from the 3rd week of January 2019 onwards. We will then announce the full winners list on our redONE website and redONE Facebook page after all the winners have been confirmed. Winners are selected via random selection by redONE. We will call & email to congratulate them! Furthermore, we will post the winners list on our redONE Facebook page & redONE website after the confirmation of the winners. What do I need to do once I am shortlisted as the winner? What happens if I am away/unreachable/missed redONE’s call? All calls will be made from 8.00am to 8.00pm, Monday to Sunday inclusive of Public Holidays. If you are unreachable after THREE (3) consecutive days, we will redraw for a new winner. We have stated this in our Terms & Conditions too. Can a participant win more than ONE (1) prize during the Prizes Draw session? No. A participant can only win ONE (1) prize during Prizes Draw session. When & how would I receive my prize? You will be contacted by a redONE representative to visit the nearest redONE Branch/Sales office to collect your prize after the winners are all announced. The respective winner(s) must be present with the prize collection letter at redONE Branch/Sales office for verification purposes. All prizes must be collected within SIXTY (60) days after the winners’ announcement date. Help! There is something wrong with my phone device prize. Can it be exchanged or replaced? You will have to refer back to the manufacturer and visit its respective authorised Support Centre. 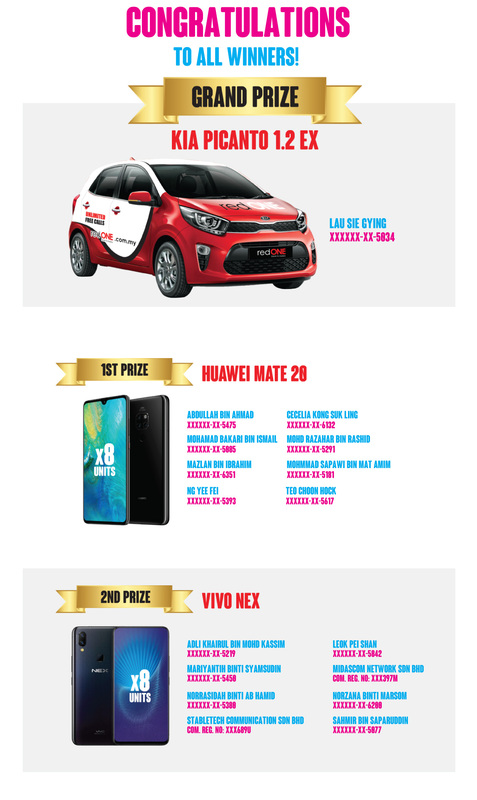 The redONE RM1 Million Prizes Giveaway (“Prizes Draw”) is organised by redONE Network Sdn Bhd (“redONE”). The Prizes Draw starts from 00.00 hours (GMT+8) on 1 Oct 2018 until 23:59 hours (GMT+8) on 31 Dec 2018. (both dates inclusive) (“Prizes Draw Period”). This Prizes Draw is open to all new & existing redONE Postpaid subscribers only. In the event where the MNP postpaid port-in is only successful after the Prizes Draw Period has ended, the subscriber(s) will be deemed not eligible to participate in the Prizes Draw. Each successful registered line is equivalent to ONE (1) entry to the Prizes Draw. The Prizes Draw participant MUST be a Malaysian citizen. The Prizes Draw participant MUST be a redONE Postpaid subscriber. All redONE directors, officers, employees, appointed partners as well as their respective parents, spouse and children are not eligible to participate in this Prizes Draw. The redONE Postpaid subscribers’ line must remain active in use during the Prizes Draw Period. Any suspension or barring to the postpaid subscribers’ line during the Prizes Draw Period will automatically disqualify the subscribers’ participation in the Prizes Draw. This Prizes Draw is also open to all new redONE Postpaid subscribers whose line are successfully activated within the Prizes Draw Period. All existing redONE Postpaid subscribers, subject to Clause 3 above, will automatically be eligible for this Prizes Draw without prior notice via phone call, SMS or email. Each shortlisted winner is only eligible to win ONE (1) Prize throughout the Prizes Draw. A total of FIVE HUNDRED AND EIGHTY THREE (583) subscribers will be shortlisted in ONE (1) round of random draws at redONE‘s own discretion. redONE will notify the shortlisted winners of their entitlement to the prize via phone calls, SMS or email based on the contact details provided by the winners during line registration. Only THREE (3) attempts of phone calls will be made to all the shortlisted winners. They will be contacted by redONE’s representative from 8:00 am to 8:00 pm, Monday to Sunday inclusive of Public Holidays. All shortlisted winners are required to answer ONE (1) question successfully in order to be declared as the winner of the respective prize drawn. In the event that the shortlisted winners cannot be contacted or failed to answer the question correctly, redONE reserves the rights to relocate the prizes for the next selected shortlisted winner. Winners will be announced on redONE Facebook page and redONE website after the confirmation of all FIVE HUNDRED AND EIGHTY THREE (583) winners. The Prizes Draw Winners will be contacted by redONE Branch/Sales Office for the Prizes redemption arrangement. Visuals of all the Prizes shown in any redONE advertisement, promotional publicity and other material relating to this Prizes Draw are solely for illustration purposes only and may not depict the actual color or look of the prizes. The Grand Prize shall exclude car registration fee, road tax and insurance coverage. redONE shall not be liable and/or responsible for the transportation costs pertaining to the collection and/or delivery of all the Prizes. Any additional costs, duties, taxes and/or incidental expenses or charges incurred in relation to the Grand Prize shall be solely borne by the Prizes Draw Winner. The Prizes Draw Winners are solely responsible for the claim and collection of the prize by visiting the nearest redONE Branch/Sales Office with the prize collection letter from redONE to collect their prizes SIXTY (60) days after the Winners Announcement on redONE Facebook page and redONE website. In the event the Winner is unable to attend the prize giving ceremony, they may nominate an authorised representative to attend on their behalf by issuing a written notification to redONE. In the event, for whatever reason, the Winner is unable to collect or accept his/her respective prizes within SIXTY (60) days from the winners announcement date, the Winner will then forfeit any and all claims to the prize. The delivery of Grand Prize to the Winner shall be subjected to the availability of the Grand Prize which shall be informed to the Grand Prize Winner by redONE. Unless otherwise specified in the Terms and Conditions herein, no substitution of replacement of, or modification to the Prizes requested by the Selected Winner will be permitted. All prizes are non-transferable and non-redeemable for cash, credit or rebate in full or in part. redONE reserves the right to substitute the prize(s) with that of a similar value at any time without prior notice. All prizes must be collected within SIXTY (60) days after the winners announcement date. redONE shall be entitled to amend, vary, delete or add to any of these Prizes Draw Terms and Conditions and/or substitute or replace the Prizes offered in this Prizes Draw with a similar valued prize and/or to modify, cancel, terminate or suspend the Prizes Draw at any time without prior notice. No compensation in cash or any kind shall be given for any losses or damages suffered or incurred by the Eligible Subscribers as a result of the above. To the fullest extent permitted by applicable laws, redONE offers no warranty or representation whatsoever, express, implied or statutory, in relation to the Promotion, the Prizes including, without limitation, the merchantable quality and fitness for purposes in respect of the prizes and level of care and skill in respect of the relevant services provided in the prizes. For any dispute in relation to the quality or warranty of the Grand Prize, the Grand Prize Winner shall resolve such dispute with the authorised car dealer without any recourse to redONE. For the purpose of clause 8(b) above, the Grand Prize Winner shall also be bound by the Terms and Conditions of the authorised car dealer in relation to the Grand Prize. redONE shall not be liable and responsible nor shall accept any liabilities of whatsoever nature howsoever arising or suffered by any eligible subscribers resulting directly or indirectly from this Campaign. By participating in the Campaign, eligible subscribers and Prizes Draw Winners give their consent to and authorize redONE to collect, use, process their names, masked Identification Numbers (IC) and other particulars (“Personal Data”) for the purpose of running the Prizes Draw, including but not limited to announcing and publishing Personal Data and/or photos of Selected Winners at redONE website for advertising and publicity purposes. All decisions made by redONE in relation to the Prizes Draw including but not limited to the shortlisting, selection of winners and forfeiture of the Prizes shall be final, conclusive and binding. If any matters arise which are not covered in these Terms & Conditions, they will be determined solely by redONE. Grant redONE the absolute and unrestricted right to modify, use and publish any still or moving images of the participants for any promotional, marketing, commercial or other related purpose, without any payment or compensation. In the event of any inconsistency between the English and Bahasa Malaysia (if any) version, the English version shall prevail. redONE reserves the right to amend or change the Terms & Conditions herein at our sole and absolute discretion. All prizes are accepted entirely at the risk of the participants. To the extent permitted by law, redONE excludes all liability in connection with this Prizes Draw. All participants agree to release redONE from and indemnify redONE against all liability (including negligence) for any personal injury or for loss or damage (including loss of opportunity); whether direct or indirect, special or consequential arising out of participation in this Prizes Draw.